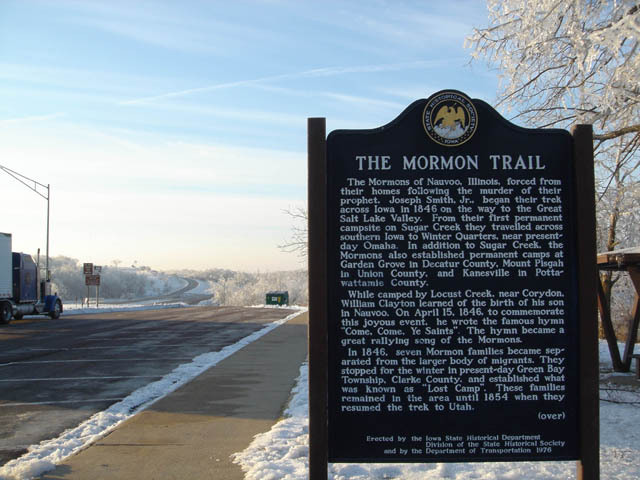 their homes following the murder of their prophet, Joseph Smith, Jr., began their trek across Iowa in 1846 on the way to the Great Salt Lake Valley. From their first permanent campsite on Sugar Creek they travelled across southern Iowa to Winter Quarters, near present- day Omaha. In addition to Sugar Creek, the Mormons also established permanent camps at Garden Grove in Decatur County, Mount Pisgah In Union County, and Kanesville in Potta-wattamle County. While camped by Locust Creek, near Corydon, William Clayton learned of the birth of his son in Nauvoo. On April 15, 1846. to commemorate this joyous event, he wrote the famous hymn "Come, Come, Ye Saints". The hymn became a great rallying song of the Mormons.